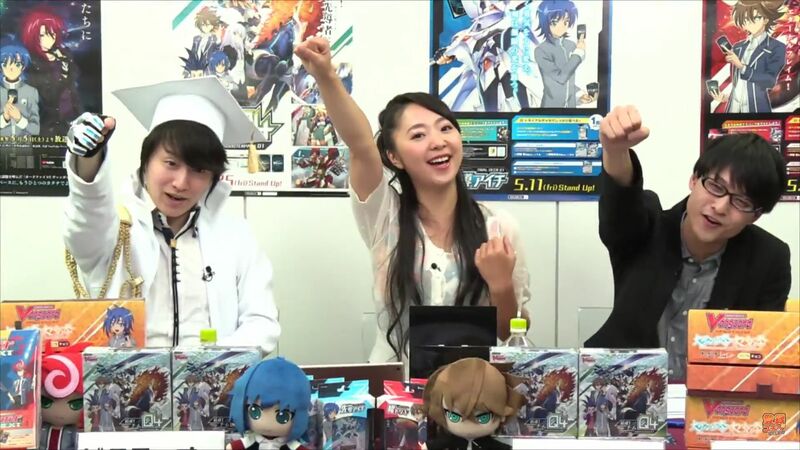 This week's special guests are voice of Tokura Misaki, Kitta Izumi, and Vanguard evangelist Maeda Seiji-sensei. Weekly Bites episode 3, start! Stand up, Vanguard! The fourth episode is titled "Misaki's Secret!!" Card Capital's shop clerk Tokura Misaki takes an interest in Sendou Aichi, who changed greatly through Vanguard even though he lacked fight experience. 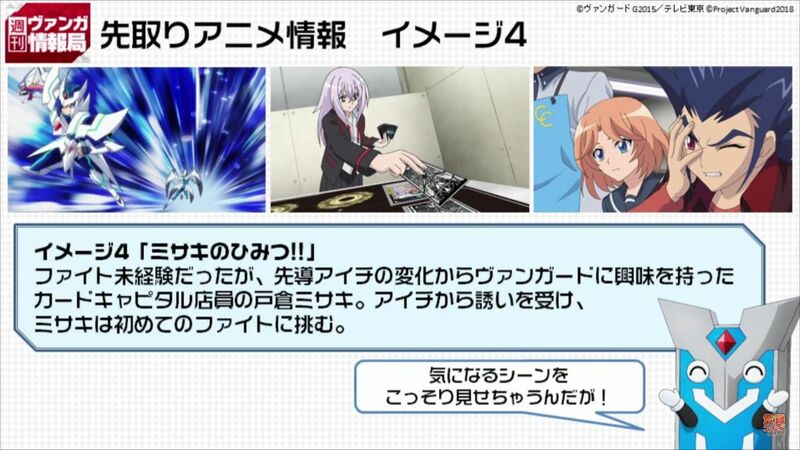 Accepting Aichi's invitation, Misaki begins her first fight. 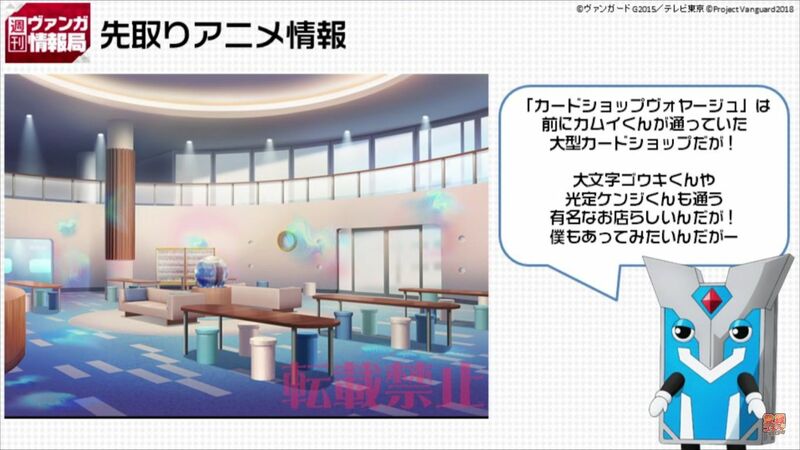 This is an early preview of Card Shop Voyage, a large shop that Kamui used to go to. Famous cardfighters like Daimonji Gouki and Mitsusada Kenji attend it, and Vangaro-kun wishes he could go too. Team NwO (Nagisa with Others) is made up of Daimonji Nagisa, her older brother and the Asia Circuit's runner-up Daimonji Gouki, Asia Circuit champion Souryuu Leon, and third-place in the Circuit Mitsusada Kenji. 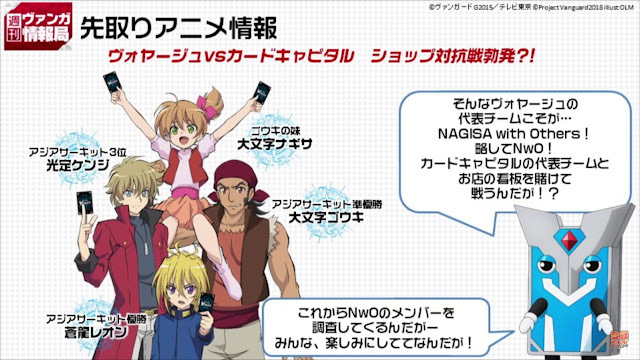 Team NwO will challenge Card Capital in the new anime series. This a significant divergence from the 2018 anime series' source material, Itou Akira Vanguard manga. In the original manga Kamui's shop was unnamed, and had been overrun by Foo Fighters lead by Yahagi Kyou.